The National Weather Service and the Grant County Emergency Management Agency utilize two types of situations to warn Grant County residents of severe weather. 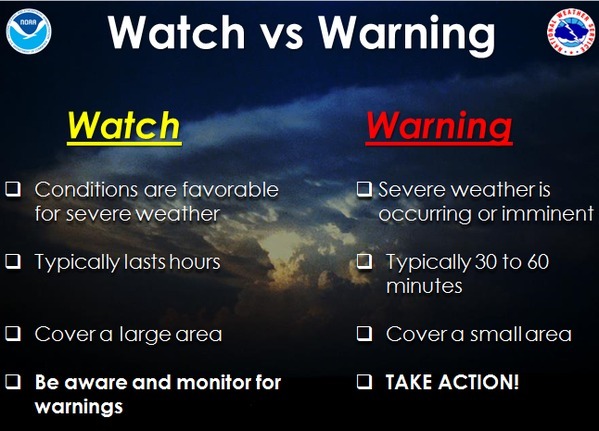 Knowing the difference between a "Watch" and a "Warning" can help Grant County’s citizens understand what actions to take to protect themselves when weather threatens. "Advisory" means that conditions are expected to remain below the warning criteria, but still cause significant inconvenience. "Watch" means that conditions are favorable for the development of severe weather in the watch area. For example, a thunderstorm watch would mean that atmospheric conditions are favorable for thunderstorms to move into the area or develop in the area at any time. Grant County residents should take time to plan what steps they will take to protect themselves from severe weather and stay tuned to local TV or radio for possible warnings. Persons should also be mindful of weather conditions, watching for changes that could signal that severe weather is approaching.